Powderpost beetles encompass members of the three beetle families: Lyctidae, Anobiidae, and Bostrichidae. Lyctid beetles are reddish-brown to black in color, and about 1/32 to 1/8 inches long. The head is readily visible from above, unlike the other two. 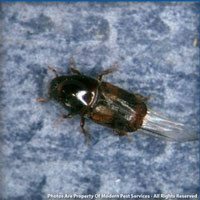 Anobiid beetles are reddish-brown to brownish-black and range from 1/16 to 1/8 inches. The Bostrichid beetles is reddish-brown to dark brown or black and 1/32 to 3/8 inches in length. 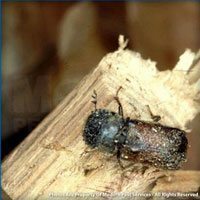 Powderpost beetles attack seasoned hardwood, and are often discovered in stored lumber, rafters, joists, finished wood, and furniture products. They usually enter lumber while it is being stored and cured, then later emerge from the finished product. They get their name due to the fine, flour-like residue the larvae leave behind when they bore holes in wood materials. They can also be identified by the small, round holes through which the adult beetles emerge. Powderpost beetles feed mainly on the starch content of wood. They are usually either hardwood or softwood (also known as conifer) feeders. When larva feed inside of wood, very fine excrement will flow from the wood’s exit holes at even the smallest movement. 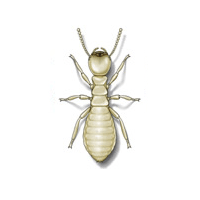 When powderpost beetles eggs are laid, they are dropped in pores, cracks, crevices, tunnels, or in old holes in wood. The small larva hatches and nestles in the wood. It digs to the surface and pupates as it continues feeding and growing to maturity. The adult exits the pupa and continues the passageway to the wood’s exterior. The length of the life cycle of powderpost beetles is influenced by the wood’s nutritive content and by environmental conditions.